A Sphere Shaped Tabletop Misting Fountain. Improve the look of any room in your home or office with the Orb of Mist Fountain. It is a convenient table top model misting fountain that features a globe instead of a bowl for holding the water. When lit, this globe appears to glow and change colors as it is lit from the center by the color changing LED lights. Position the opening any way you want it for a variety of different looks and effects. This unique decoration is a humidifier, air purifier, aromatherapy diffuser and fog generator all-in-one. The Orb of Mist Fountain is small enough to fit almost anywhere, and is a unique water feature that would easily enhance any room. This fountain comes with a white, frosted glass globe and a sturdy black metal stand. As with all our fountain models, all you need is water to create an amazing cloud of mist. Just add water to the globe, push the button and relax while soothing sounds of water, a mesmerizing light show, and a billowing cloud of mist. Enhance your home or office. This fountain is able to generate fog and mist by utilizing electrical oscillation technology. The ceramic disc in the misting unit vibrates under high frequency to generate negative ions and a natural fog on the top of the water. There are no chemicals or dry ice involved. Just simple tap water is all you need to enjoy the benefits of this unique misting fountain. A ring of LED lights rotate colors to illuminate the globe and intensify the look of the mist. With such a colorful light show, it can almost be considered a lamp. Whatever you call it though, this is one colorful and unique decoration for your home or office. This fountain not only looks good, but it is beneficial to your health and well being too. The Orb of Mist is a natural humidifier, and the moisture created can help people with allergies or respiratory problems. The negative ions generated are also helpful for purifying the air. With the addition of just a few drops of oil, this fountain becomes the best aromatherapy diffuser ever. The 12, color changing LED lights on this fountain add to the charm and appeal. 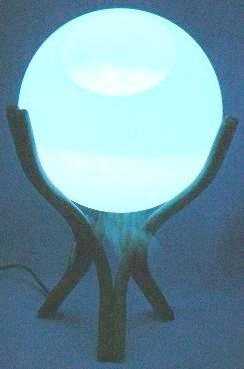 The Orb of Mist Fountain is good for every living thing in your home or office, even your plants! Because the Orb of Mist humidifies the air, it can be incredibly beneficial for your house plants. Many plants thrive in humid climates because the liquid in the air can easily penetrate and feed the plants. Our mist fountains can simulate conditions of a more humid climate. Plus they clean the air of contaminates, so your plants, and everyone else, breathe cleaner air. Bring some tranquility to your home. Order Your Orb of Mist Fountain Today. The Orb of Mist - Includes a misting device with color rotating LED lights, colored glass base, and your choice of colored glass bowl. Perfect size to put almost anywhere. Order Yours Today!